We are here to erode the myth, to support women and men who have pride in their stripes of accomplishments and wisdom in their wrinkles. We’re here for those who are curious, courageous and explorers; who have broken barriers before, and who again seek to shape our future in ways that are better than what came before. Living in a world of texting and 140 characters, the words we use are even more critical than ever before. The words we use have a significant impact on what’s influenced, understood, misunderstood and acted upon. The static stereotyping, the generational language of old (over the hill, grey-haired, old fogey) is no longer accurate or acceptable, for anyone, as we’re experiencing life in a very different way than those who came before us. Thrivers™ are amazing people of substance, sophistication, insight, inner power and purpose. You know who you are. You are curious and thrive on exploration; to shape your future in ways that are better than before. 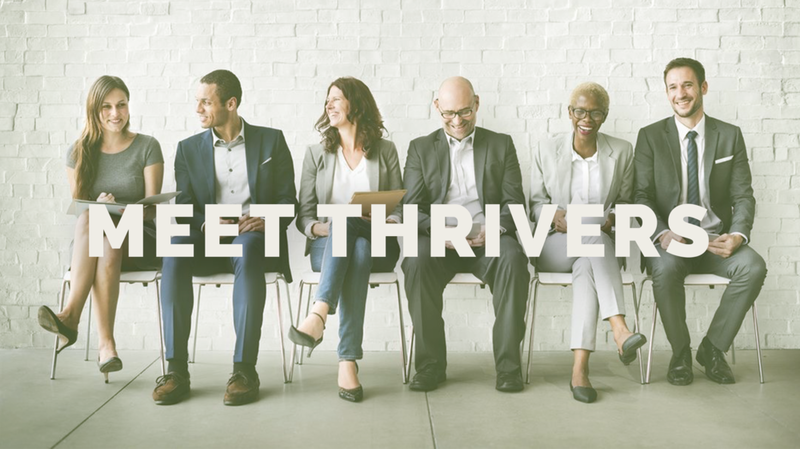 Thrivers™ are an exceptional tribe of warriors, who are proud of fulfilling careers, and are redefining how to be inspired, be productive, to make more contributions and make more of a difference, this time, more in our own way. For some, likely many – and perhaps for the first time – we’ve have the financial, social and psychological means to be able to be who we really want to be. As Thrivers™ we did what was expected and we defied stereo types (e.g., counterculture, new paths to independence, and women’s rights). We carried the ball everywhere in everyday. Today it’s called work/life balance. We just did what was needed without a title or trend analysis or magazine headline. We took on challenges, mastered them, and paid it forward. Sometimes we were comfortable, and sometimes not all that at-home in our own selves. We know we’re not perfect. Yet we hold quality, objectivity, honesty, and impact as a duty that is not up for compromise. After years of hard work and contributions, we want to keep going -- perhaps in new ways –-to stand on the shoulders of your experiences and do more, for yourself, and a slew of others. In small everyday ways and together in big important ways. The Gateway to getting unstuck. Ok, we’ve been there before, yet this time it has a bigger-ness to it --- more heartfelt and emotional, driven by our own desires, not what’s been expected of us as individuals and as leaders. In every case, the most important step to getting unstuck is realizing you’re stuck. What demands attention today is how we empower and inspire ourselves and those around us to harness the disruptive potential of change and new cultural requirements to drive individual fulfillment, social impact. And, for our businesses revenue growth and brand stature. Reinvention was once the pathway to staying ahead. Today, it is purpose that’s defining new ways to stepping ahead. Purpose is the key to living a longer, happier, healthier life. It’s the key to creating a better world. When we call purpose into our lives, we make the bold decision to be original, to build a life that fulfills us, provides for us economically, allows us to connect with the people we love and uses our greatest gifts. Purpose is our initiation to the path of personal and professional leadership, of finding our own voice, forging our own path in the world, of contributing all we have towards the greatest good.